IT WAS THE SUN WOT DONE IT! THE TRUTH! WE’RE A BUNCH OF CROOKS! CAN THE LAST ONE LEAVING THE SUN PLEASE TURN OUT THE LIGHTS? Britain’s best selling newspaper, The Sun, is in crisis after 5 of its senior journalists were arrested over corruption allegations. 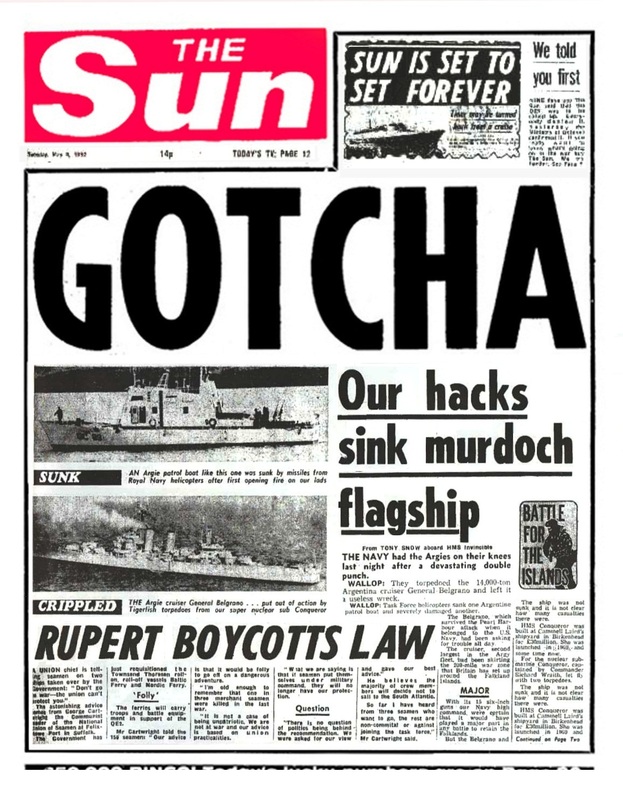 The Sun’s most infamous headline was during the Falkland’s War when it reported on the sinking of the General Belgrano with the loss of 323 lives. The Sun also falsely and disgustingly accused Liverpool fans of urinating on the bodies of those who died in the Hillsborough disaster, including children. Noting would supprise me coming from this rag! It would be such a pleasure to see this blot on humanity disappear under a torrent of arrest warrants. It looks to me as though Murdoch is throwing everything he can to the wolves in the hope that if he keeps them occupied long enough with his lower echelons, they won’t have time to get to him. So what if he loses a few newspapers – he’s still rich enough to do what he wants, certainly enough for new ones to be built up, in time. Yes – the profit he makes from the Sun is chicken feed compared to what he makes from Sky, Fox News, 20th Century Fox etc. If he thinks it necessary to close it down, he will. Murdoch will want to disassociate himself from this mess as soon as possible. But can he afford to annoy so many readers as well as drive them into the hands of his enemies? Its not about money but power and influence and even popularity (hence the twittering). Politicians were frightened of The Sun, I don’t think they will quake at Sky News in the same way. Yes Paul, you could be right. So it’ll be interesting to see what he’ll do. Maybe he’ll just sack all the employees and employ a whole bunch of new guys. If this is indeed true, good riddance to bad rubbish!